Google Chrome is one of most popular browsers in the web. Google published the first version in 2008 and completely overhauled the browser in 10th anniversary update during 2018. Initial days, Chrome struggled to compete with Internet Explorer, Firefox and Safari browsers that dominated the web. Later the popularity grown with Google’s marketing effect and with the easy to use interface. 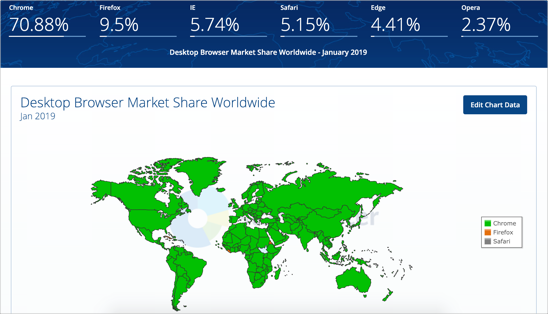 In January 2019, Chrome reached 70% of the global desktop browser market share as per the statcounter statistics. Though everyone is moving on to Chrome, it has it’s own pros and cons. In this article, let us explore the advantages and disadvantages of Google Chrome browser. First let us start with the advantages of Google Chrome. Google revamped Chrome’s design in 2018 and updated many features. Chrome looks sleek and simple using the Material Design concept from Google. Windows version of Chrome doesn’t even have traditional menu items on top and packed with all features behind simple settings page. The idea is good that most of the users don’t need to tweak browser’s settings. However, you can setup specific settings for individual websites like blocking pop-up, blocking ads, etc. The sleek design results in high speed of Chrome. We use Firefox / Edge / IE in Windows and Firefox / Safari in Mac. Many websites take long time to open in Firefox and Safari that instantly load on Google Chrome. Though there are problems like resolving host happens only on Google Chrome, the speed is definitely a differentiator. Block dangerous and malicious sites. You can simply enable “Safe Browsing” option in settings. Chrome cleanup tool for Windows PC will help to identify and delete malware that affects your browser. By default, Chrome will show lock pad icon in the address bar to indicate the secured connection of a site. Chrome will also show a site as “Not Secure” when the site does not use HTTPS encryption. You can keep away from those “Not Secure” sites and avoid providing personal and credit card details on those sites. Google uses a custom Blink Browser Engine (except on iOS app) and offers a cross platform browser. Unlike Edge and Safari, you can use Chrome on Windows, Mac and Linux platforms. Though certain functionalities like changing language are different in Mac and Windows, most of the features remain same. This will help to have same user experience across all desktop devices. For example, many of us are habituated with “Control + Enter” to add .com suffix to a domain name in Windows. You can use the same “Control + Enter” shortcut keys in Chrome Mac to add .com suffix to websites. One of the big advantages of Chrome is to login using your Google account and synchronize all bookmarks, history and other data across your devices. This will help to save bookmarks on your desktop and pick it up on your Android mobile a day later. Google Chrome has large number of extensions to enhance the browser’s functionalities for special needs. Starting from simple ad blocking to custom extensions for teachers, bloggers and artists are available. There are two marketplaces to install extensions on Chrome – one is Chrome Web Store and other is G Suite marketplace. You can also hire developers to build your own app to improve your workflow on your project. Chrome became the biggest winner in the browser’s world due to the easiness to integrate with other Google products like Gmail. Logging in to Chrome will automatically login to other Google apps like Gmail, Analytics, AdSense, Google Ads, Search Console, etc. In addition, Google also capitalized the success of Chrome by integrating with other products like Chrome OS and Chromecast. We have been using almost all the web browsers for a while and Chrome has an indisputable and powerful Developer Console. You can monitor network bandwidth, view source code and choose colors to adjust the design online. The integration of Lighthouse extension also helps you to do SEO audit of your webpages right from the browser. In addition to the built-in developer console on stable version, you can also try out Chrome canary, developer and beta versions to test your development work. Chrome offers amazing tab management features. You can open a webpage in a new tab on the same windows, tab on a new window, in incognito mode or use guest mode. Unlike other browsers, when one of tab crashes, other tabs on Chrome will continue to work without crashing. Simply drag and drop a tab to a new window and move across within same window. Drag and drop a hyperlink from a webpage to address bar to open the page. Google Chrome has many powerful features. Some of them are translation, PDF Viewer and Omnibox. The omnibox has many functions like opening a website URL and directly searching using default search engine. You can install and use Chrome without admin access on your computer. This will help to install Chrome on your office or school computers in which you don’t have admin access. Similarly, you can easily uninstall like any other program to delete the entire trace. Well, everything that glitters is not good. Chrome has some really annoying features, especially after the 10th anniversary update. Chrome is basically an open source browser based on Google’s Chromium project. However, there exists a Chromium browser independent of Chrome. This is always confusing normal users like WordPress.com and WordPress.org. Recently, Microsoft also announced that Edge will use Chromium open source and offer independent browser for Windows and macOS platforms. This will make Google a literal monopoly in the browser world. Google is very popular for privacy related issues and many times fined from European countries for processing information without the user’s concern. When you login to Chrome and sync all your browsing activities, you hand over the entire control of your data in Google’s hand. If you are worried about the privacy then simply uninstall Chrome and go for Mozilla Firefox. Remember that Firefox also uses Google as a default search engine. So you need to change the search engine for getting out of Google. Google Chrome consumes more CPU and RAM compared to other browsers. Though the browser is lightweight, high memory consumption will impact the use of other applications on your computer in parallel. Google is only a default browser in Chrome OS. However, on Windows and macOS, you need to change the default browser from Edge and Safari to Chrome. Even that will not solve the problem completely. Whenever you open HTML pages offline, the operating system will try to use the in-built browser. Though you can setup default apps for each file type in Windows, it is a hassle. In addition, there are no possibilities to remove Edge and IE from Windows and Safari from Mac. So you need to live with multiple browsers to handle the same tasks on your computer. Chrome doesn’t allow certain customization and options like other browsers. Whenever you close a browser window with multiple tabs, Chrome will not warn you. This is a real problem that you may accidentally close a browser with multiple tabs. Less customization for new tab pages. Chrome is not part of the default operating system in either Windows or macOS. Yet, it is a most popular browser in the world which is a surprising fact. This clearly indicates people don’t worry much about privacy stuffs and looking for good functional browser. Though there are some disadvantages, Chrome is undoubtedly a king of current browser world.